We are open for education visits 9.00am – 5.00pm, Monday to Friday. All visits include unlimited time in the Museum. Start and finish times are flexible but we recommend a minimum visit of approximately 2.5 hours if participating in an Education Programme. Most of our programmes are free of charge. Minimal charges may apply for programmes that require extra Museum staff members’ assistance, or for specialised programmes, subject to the Education Officer’s review. All accompanying adults are also free of charge. 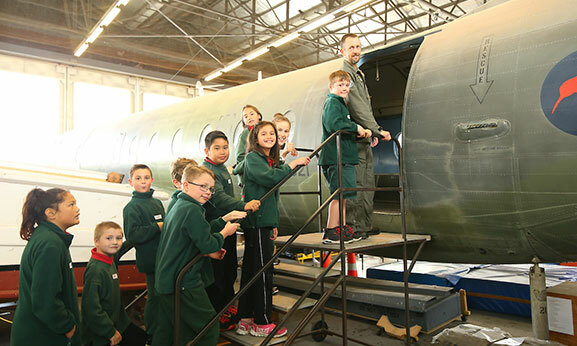 As the Air Force Museum is a registered charitable trust, a koha is welcomed and appreciated. Indoor and outdoor eating areas can be provided for visiting education groups. You can bring your own morning tea and/or lunch to eat at the Air Force Museum, or food can be purchased in the Museum Café by prior arrangement - please advise us of your requirements at the time of booking. The Museum has the facility for storage of bags and jackets for up to 60 students. It is recommended that children wear suitable warm clothing and footwear for moving about the Museum facilities, especially during winter. All teachers are encouraged to visit the Museum beforehand to discuss and familiarise themselves with the programmes and facilities. This can be arranged by contacting the Education Officer (contact details below). Any group that makes a booking will be posted a full confirmation pack to prepare them for their visit. This will include general Museum and programme information, Museum worksheets and hunts to photocopy, timetables, stickers for name tags, Risk Analysis Management (RAMs) form, and more. Visit our Early Childhood, Primary and Secondary education programme pages to browse a complete list of education programmes on offer. To book a visit, please contact the Education Officer. It is highly recommended that you book at least four weeks in advance but, depending on available spaces, this timeframe can be flexible, so please contact us to check.